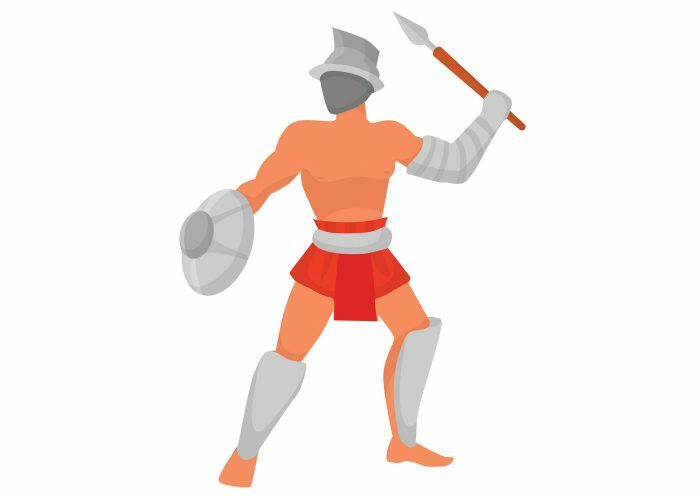 Roman Gladiators - What Type Would You Be? 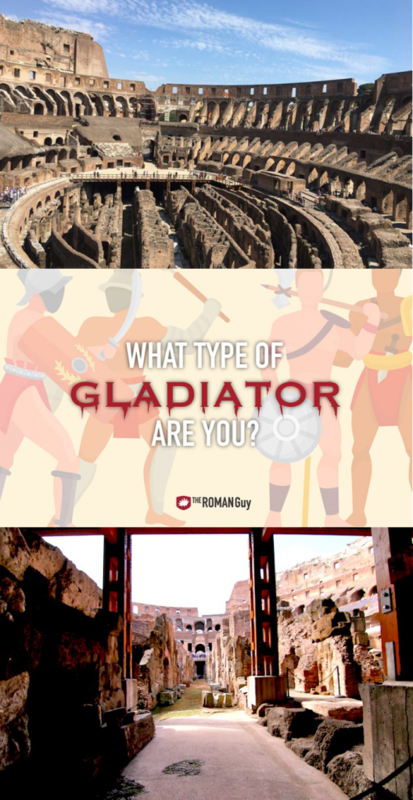 Home Italy Travel Blog	Roman Gladiators – What Type Would You Be? The celebrities and pop stars of ancient Rome, Roman gladiators provided the most popular form of entertainment for all tiers of society. There were many kinds of gladiators, and each went though specific training. 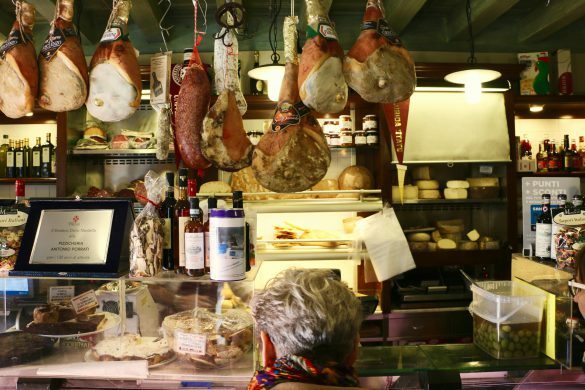 Now, imagine you lived 2,000 years ago in ancient Rome. 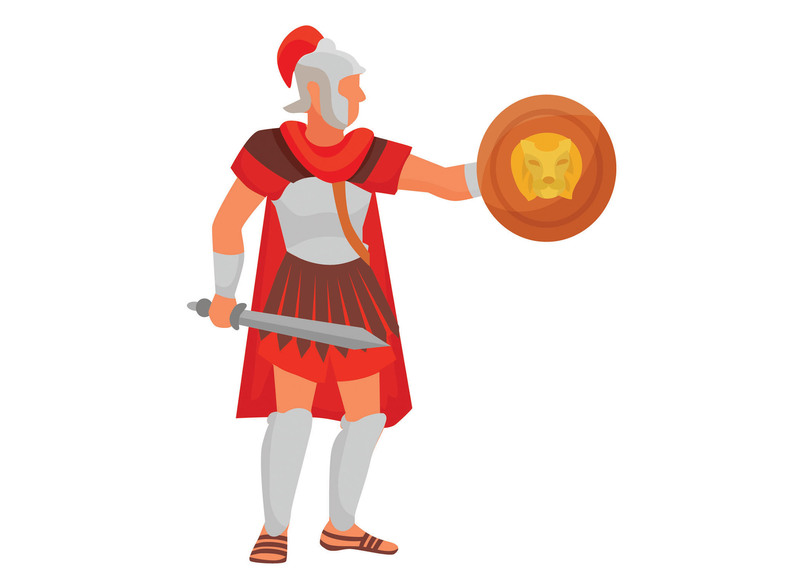 Based on your physical attributes, background and personality, what type of Roman gladiator would you be? 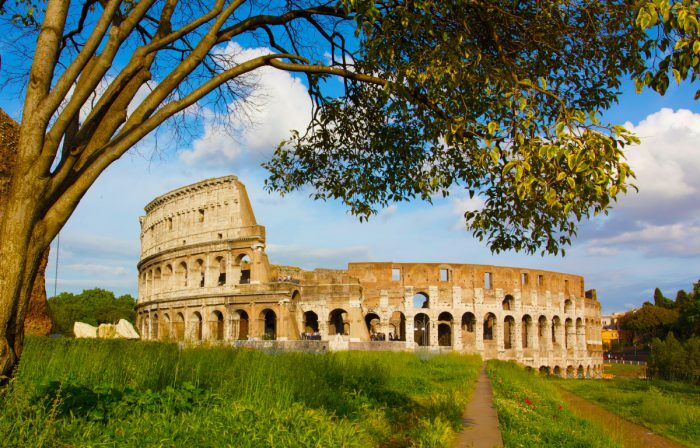 Planning your perfect Roman holiday? 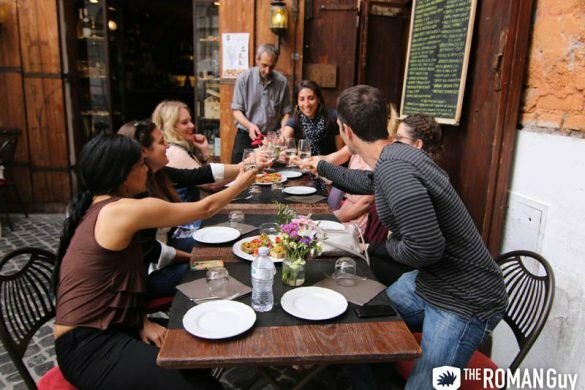 We offer a ton of awesome Rome tours, including the best Colosseum tours around. 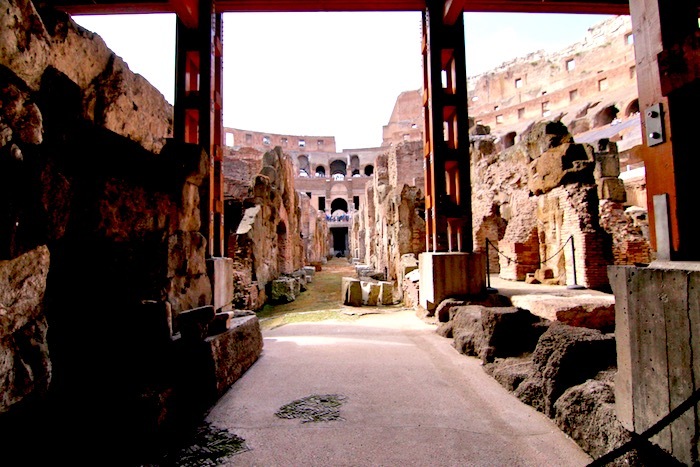 Skip the lines at the Colosseum and access the coolest restricted areas. Like the Colosseum Underground, Top Levels and Arena Floor. Trace the footsteps of gladiators! Whether or not a gladiator chose the life, they all trained to fight in a specific class. For example, short and muscular men trained to fight as a heavily-armored hoplomachus. On the other hand, a retiarius gladiator required a more lithe and agile build. Combatants faced off against opponents with different, but equivalent weaponry. Generally speaking, the most typical pairing was a heavily-armored gladiator against an agile, lightly-armored one. Forcefully conscripted into gladiator schools, the first Roman gladiators were criminals, prisoners of war and slaves. Faced with the choice of fighting to death or execution, performing in the amphitheaters was not a choice. However, as the gladiatorial games increased in popularity, even free men (and some women!) chose to participate. Gladiators weren’t expected to live long, but successful contestants did enjoy wealth and admiration. If you’re an American, recall the Harlem Globetrotters. Brilliantly athletic, coordinated and theatrical, the team is always pitted against the Washington Generals. While the Globetrotters perform spectacular tricks and score endless slam dunks, the Generals are paid to look like fools and lose night after night. A noxii gladiator in ancient Rome is the equivalent of a Washington Generals player, except they die. Unskilled and woefully unarmed, noxii weren’t gladiators in the true sense. Instead, these prisoners of war, convicted criminals or religious outcasts (Christians and Jews) were condemned to die in one of two ways. Either torn apart by wild animals, or murdered by more skillful and trained gladiators, both methods of execution were brutal. As barbaric as they were, these public displays of cruelty reminded Roman citizens about the perils of breaking the law. Did you know that women were Roman gladiators? Well, it’s true! Even now, people disagree about funding women’s sports or putting female soldiers in combat roles. However, in ancient Rome, women created scandal by fighting bare-chested for sport. In order to mix up gladiatorial events, matches between women provoked scandal and excited crowds. A gladiatrix wore scanty armor and no helmet. Without a helmet, the female fighter’s gender was obvious to spectators. Usually, fighting one another (or sometimes dwarves), some female fighters came from high-status families. Fascinatingly, these fierce female fighters chose to go “slumming” with low-born or gladiator-turned slaves. Retarius, which means “net man” or “net fighter” in Latin., were styled like fisherman. 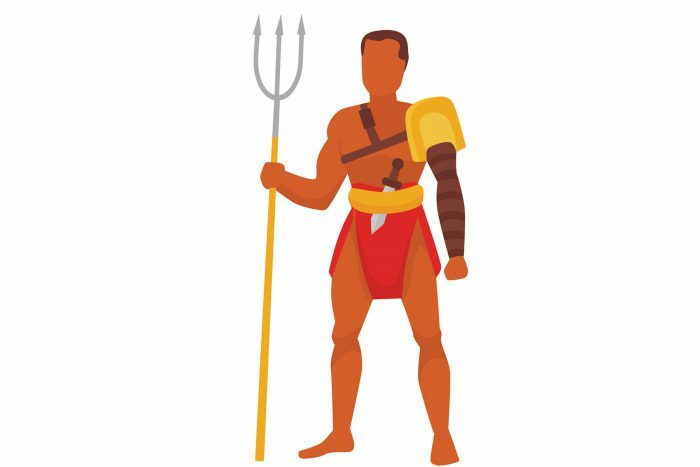 These agile Roman gladiators defended themselves with trident, a small dagger and a weighted net to ensnare their bulkier opponents. Almost naked, retiarii wore only a loincloth, an arm guard (manica), a shoulder guard and went without a helmet. Retiarii experienced a lower rank in society and had worse living conditions. One reason for this lower social standing is the retiarii’s associations with femininity and homosexuality. However, regardless of how Romans felt about them, retiarii complemented the fighting styles of the hoplomachus and secutor well. Carrying a spear, a sword and a round calvary shield, equites gladiators took their name from the aristocratic equestrian class of the same name. Equites means “horseman” in Latin – these entertainers mimicked mounted Roman knights in the ring. First, an eques gladiator entered the ring on his horse and battled with a lance. Eventually, after someone fell off their horse, the battle continued on foot with swords in close combat. If nobody fell off, the fight eventually continued on foot anyway. Athletic and agile, these matches added fanfare to a lineup of gladiatorial contests. Fighting with two swords at once in close combat, dimachaeri gladiators inflicted a barrage of slicing strikes on his opponents. While a match with a dimacherarus required a high level of skill, Romans thought this type of fighting to be insidious and sneaky. Waiting for the opportunity to attack, a dimachaerus gladiator struck his opponent’s body again and again. As a fast and unencumbered gladiator, a dimacherarus gladiator fought more heavily armored opponents. Derived from the Greek for “heavily armed”, hoplomachi gladiators originated from Hellenic warriors called hoplites. Paired against murmillones gladiators who represented Roman soldiers, these fights reenacted the Roman Greek wars for entertainment. Fighting with the short, leaf-shaped sword, a hoplomachus gladiator fought like a the Greek hoplite. Besides the sword, they also used a lance for thrusting and wore a visored helmet with a massive crest ridge. Originally, gallus gladiators were prisoners of war from the Gaul tribe in Central and Western Europe. Relying on strength and armor to win a contest, a gallus gladiator wasn’t agile like the retiarii. Clothed and armed to resemble barbarians, gladiatorial fights with gallus acted out the Roman Empire’s victories over various rival groups. Eventually however, Gauls became part of the Roman Empire. At this point, gallus gladiators became murmillones, because it was no longer politically correct to depict them as enemies. If you had to name a famous gladiator, who would it be? 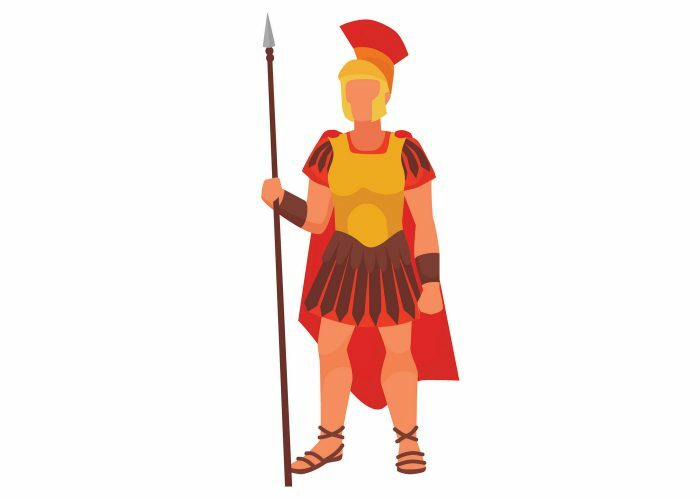 You probably thought of Spartacus, the prisoner of war from the Thracian tribe who led an uprising against his captors. Gathering an army of 70,000 rebels, Spartacus went to battle against his enslavers and won. Recognizable by a helmet with a griffin’s head crest, women lusted after Thraex gladiators. Fighting with a short sica sword, a round shield and sometimes a spear, thraex were tall, lean and strong. The secutor’s name is based on his fighting technique; “secutor” means “the chaser” in English. 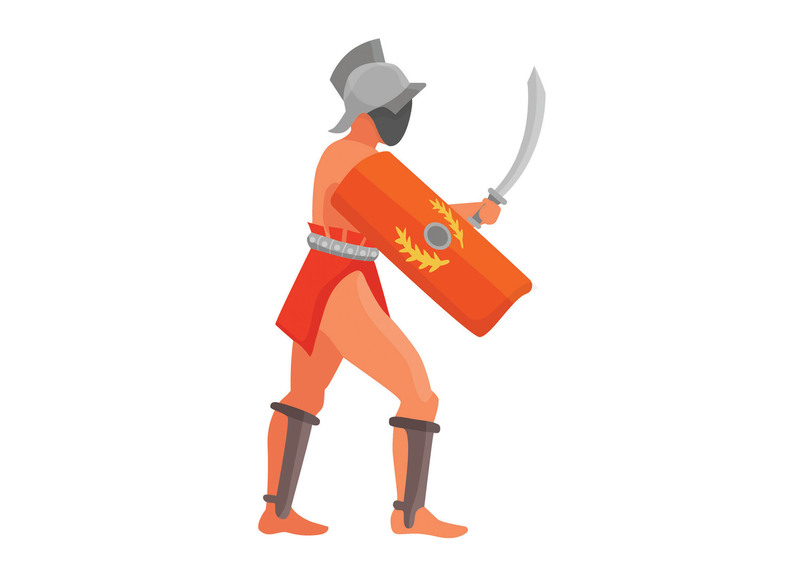 Paired against the nimble retiarius, a secutor gladiator chased his opponent with a sword. Protected by heavy armor, the most easily recognizable feature of a secutor’s appearance is his smooth, round helmet. Shaped to prevent getting ensnared in a net, the helmet featured two small holes for eyes. Carrying around the armor led to exhaustion during a match. Not to mention, the secutor’s helmet shape hampered his ability to breathe deeply. And so, facing off against an unencumbered, but unprotected retiarius was a popular event. Armed with a short, straight sword, provocatores most resembled Roman Legionaries. Protected by a rectangular breastplate and a helmet with a feather on either side, these highly-skilled fighters only fought each other. Fighting to settle feuds between rival gladiatorial schools, winning also meant an increased social standing and wealth. 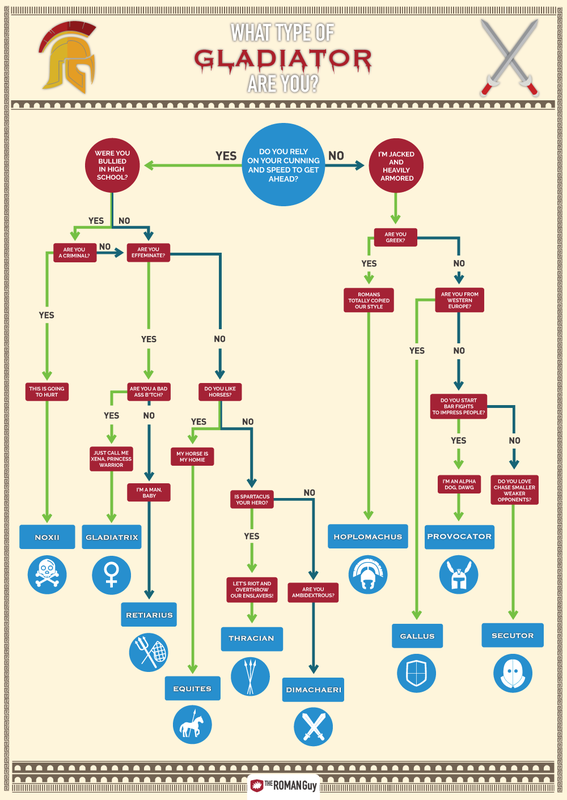 Unlike other contests, provocatores chose their own fights. 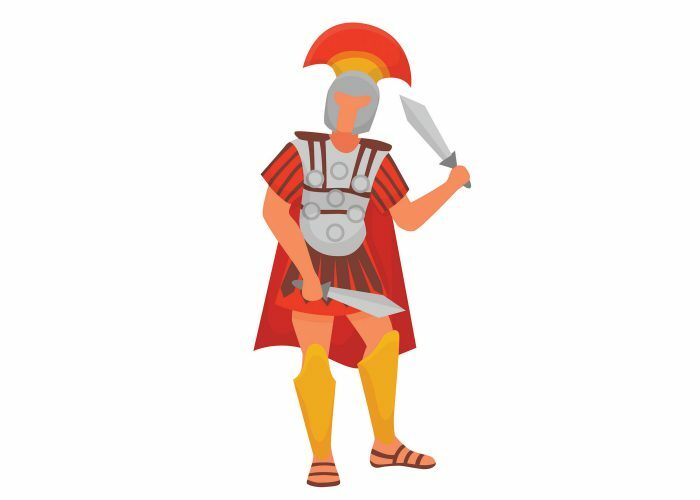 Want to learn more about Roman gladiators and the Colosseum? 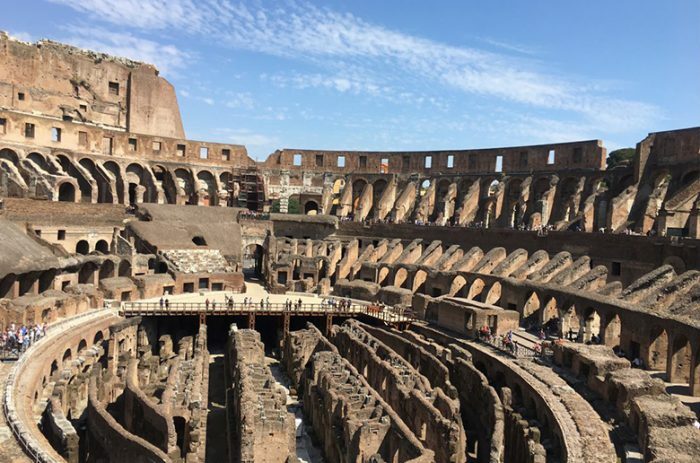 On a trip to Rome, make sure you tour the Colosseum. However, make sure you plan ahead! 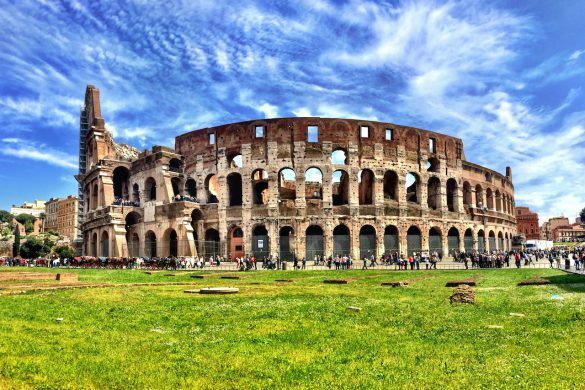 When it comes to visiting the Colosseum, the key is skipping the line. 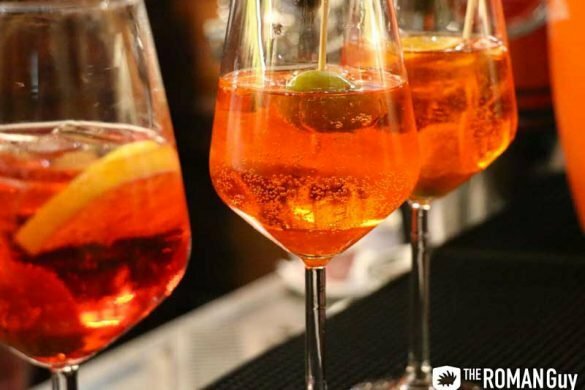 Do this in two ways, either book ahead online or reserve a Rome tour of the Colosseum. When you arrive, go straight inside to see the inside of the 2,000 year old amphitheater. If you’re determined, it’s possible to save some money by navigating the Colosseum’s website and booking your tickets directly. However, Italian websites are challenging for English-speakers to use. Additionally, if you reserve a guided Colosseum tour, you gain access to places that are normally restricted to tourists. On a Colosseum Underground tour, walk out onto the reconstructed Arena Floor where gladiators spared. Them, visit the “Hypogeum“, or Underground area. Featuring two levels and networks of tunnels, the Colosseum Underground is where gladiators and wild animals awaited their fate on the Arena Floor. 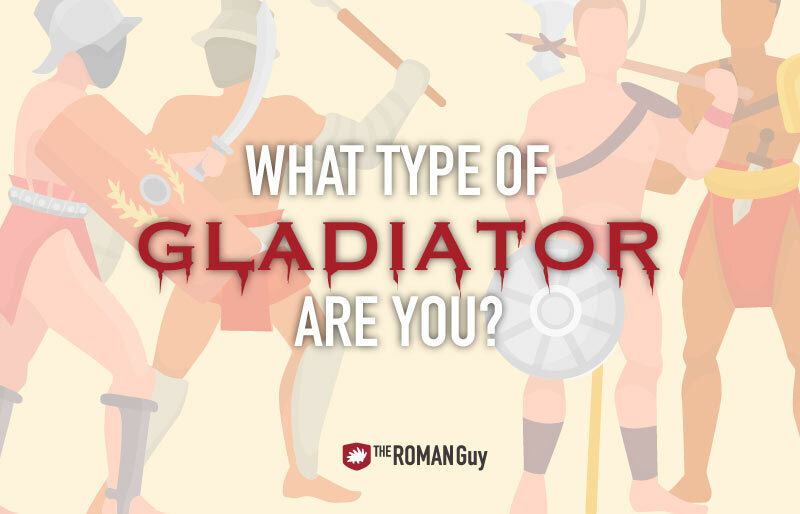 Now that you know what type of gladiator you are, you owe it to yourself to see where the action took place.